Conservationists expressed concern earlier this month when three great white sharks washed up dead on Western Cape shores in a matter of days – an unheard-of event in this part of the world. Orcas (Orcinus orca) are recognised as the only natural predator of the white shark, but fatal encounters between these two apex predators are rare, and have been documented on only a few occasions in recent decades. Nevertheless, white sharks have evolved to avoid the threat orcas pose – evidence shows that white sharks will avoid areas where they perceive orca vocalisations (real or recorded). Necropsies revealed that the livers of all three of the white sharks found in the Cape had been removed – a behaviour that has been known to occur with sevengill sharks in False Bay, as well as sevengills off the coast of California. The removal of the livers, along with bite marks and pectoral damage found on two of the great whites, led experts to surmise the most likely cause of death was predation by a pair of orcas that have been sighted in the bay on several occasions since early February. The liver of the first shark found had been so cleanly removed that the she bore no visible bite marks – perhaps an indication of how expert orcas have become at this form of predation. Orcas have previously been intermittent visitors to our coastline, but in recent years the length and frequency of their stays seems to have increased, and this is the first time great whites had been washed up in such numbers. Bizarrely, just a week before the great whites were killed in Gansbaai, orcas killed 4 gray whales in a spate of attacks on the California coast, an event that veteran orca researcher Nancy Black described as equally ‘unprecedented’ in terms of the speed and precision with which the kills were executed. ‘The consumption of only the sharks’ liver raises some interesting questions to the purpose of the predation,’ adds Ichthyologist, Dr Neil Deacon. ‘This organ is comparatively large in sharks and is uniquely rich in vitamin A and squalene – an oil that is generally found in very low concentrations in nature has been long valued by people for its medicinal properties, which include therapeutic effects on some cancers. This could imply that the orcas may be suffering from a nutritional deficiency, as taking on such a formidable predator as a great white, particularly a large sub-adult such as the female in this recent case is very risky, especially if one considers that white sharks are evolved to prey on mammals,’ says Dr Deacon. The results of a five-year study released University of Stellenbosch in 2016 indicated that only 353 to 522 great whites still exist on the South African coastline – a critical mass that could face extinction if measures are not taken to ensure their protection. ‘Three lives in a population already this low is not good news,’ said Dr Sara Andreotti, one of the study’s lead researchers. These events have further highlighted the need for the increased protection of great white sharks –those magnificent, yet vulnerable, apex predators that are so vital to the health of our oceans. Even if orca predation upon great whites sharks is a natural phenomenon, it is still a result of man’s actions that their populations are so precarious. 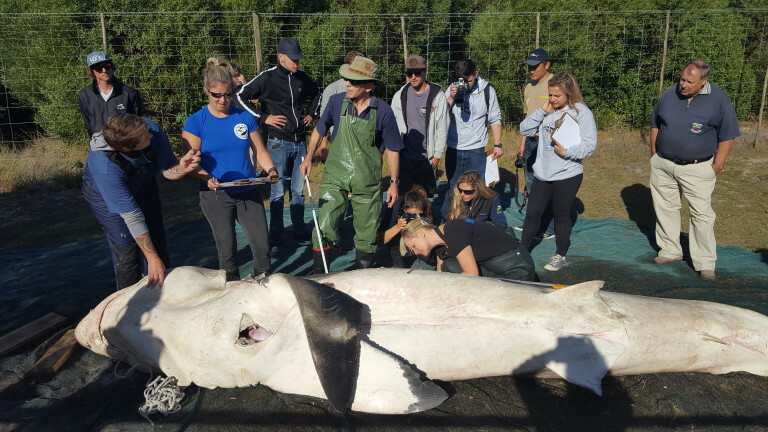 ‘This shark had been in the bay before and was recorded in database as an estimated 4m in length, she adds, but when measured on land it was 4.9m, which shows how much we tend to underestimate the size of these amazing animals. 3.4 m mature male found dead – heart, liver and claspers missing. 4.4 m male stranded – liver missing.